Guitar songs for beginners need to have two qualities: They must be easy to play and sound great. 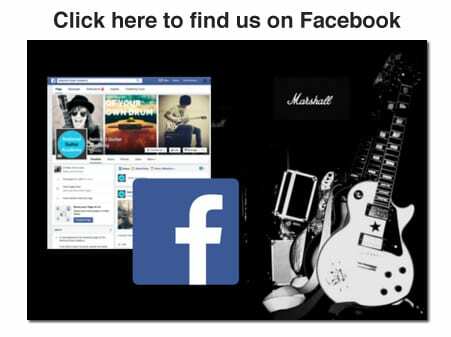 5 cool guitar songs for beginners that develop your chord accuracy. It’s strangely hard to find good guitar songs for beginners online, so we made a list of 5 tracks that we often use with our students. ‘Songbird’ was the fourth single from Oasis’s album ‘Heathen Chemistry’ and was the first single written by Liam Gallagher. It’s a sweet acoustic track. This is one of the best guitar songs for beginners because A) it’s easy and B) it really helps to develop your strumming ability. To change between G6 and Em7, all we need to do is lift that middle finger off. Dead easy! If you want to fill this out a little bit more you should play Em, instead of Em7. This makes it a little bit harder, but I think it makes it sound a lot better. So for the easiest possible option, go with the Em7 chord shown above. After that it’s basically four bars of G6 followed by four bars Em7 in a repeating pattern. ‘Songbird’ is a short and sweet song, not much longer than two minutes and has a very consistent feel. No complicated time changes or anything like that. Just a nice, simple repeating chord pattern. So how do we strum ‘Songbird’? The best approach is to pluck the bass note (the sixth string) first and then strum the whole chord down then back up. When I play this song along with the record, I tend to follow the tambourine as it’s quite prominent in the mix and seems to keep the beat nicely for a matching guitar strum. The G6 and the Em7 are both quite forgiving chords as they use all six strings, so we can get away with strumming them quite freely, however this song has quite a tight strumming feel, so keep the pace up! Guitar songs for beginners need to be easy and fun, but we also want them to challenge you and improve you. This track fits the bill, particularly with regard to rhythmic strumming. While it can be an advantage to have a lot of bars of the same chord as it means we’re not constantly changing from this chord to that chord, the negative side of that is it can be a bit easy to forget which bar we’re on and lose our place. It’s important with songs like this to concentrate to ensure we play the right number of bars for each chord. One way to be sure of this is to count the beats as you play, but some people find that approach a bit too ‘robotic’. Singing along will help, and tapping your foot to the beat is a fantastic way to ‘ground’ yourself in the timing of the track. When playing along, make sure you can hear both your guitar and the record in equal measure. This is probably the most famous song by ‘The Boss’. It’s the opening track from his 1984 album of the same name and it’s fun to play on both electric and acoustic guitar. This is one of my favourite guitar songs for beginners because it’s so simple. Why is this one of the easiest guitar songs for beginners? It only has two chords! The chords for this song are Asus2 and Dsus2. The great thing about these chords is they only use two fingers each and it’s quick and easy to change between the two. When switching between these two chords, I like to use the first two fingers (index and middle) for the Asus2 and the second two fingers (middle and ring) for the Dsus2. That way, the middle finger can stay where it is for both chords. Basically, the sequence is four bars of Asus2 and four bars of Dsus2 repeating throughout the entire song. How do we strum it? 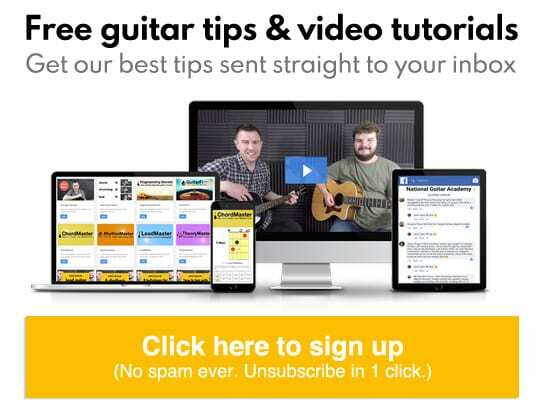 Guitar songs for beginners need to be easy to strum and you’ll note that I recommended starting off with quite sparse strumming, building up to more ‘filled out’ strumming. These strumming suggestions are of course just that: Suggestions. Don’t be afraid to do your own thing with the strumming once you get into it. So long as we’re in time and have the right feel, we’re good. I find a good way to keep my place when playing this song is to sing along as I play. If a certain chord change happens on a certain word of the song, then the words can serve as useful markers for us. Don’t be shy about singing along, even if you don’t have the best voice in the world. Even if someone else is going to be doing the singing when you take this song to an open mic night or a jam in someone’s living room. We’re just singing here to keep our place and know where we’re up to in the song. If you find that singing puts you off, try counting the beats and bars instead. It’s a bit more of a mechanical way to do things, but some people prefer it. Once you get the hang of the chord changes, have a go playing along with the recording. This is one of the best ways to ensure that you’re playing in time. When playing along, make sure you can hear both your guitar and the recording in equal measure. If one drowns out the other, it defeats the object and becomes difficult to hear that you’re in time and in sync. Remember, if a bass player (or any other musician) want to play along with you and asks you what the chords are, don’t forget that you have a capo on the second fret. A capo raises the key of your guitar so you need to tell them the chords are Bsus2 and Esus2. 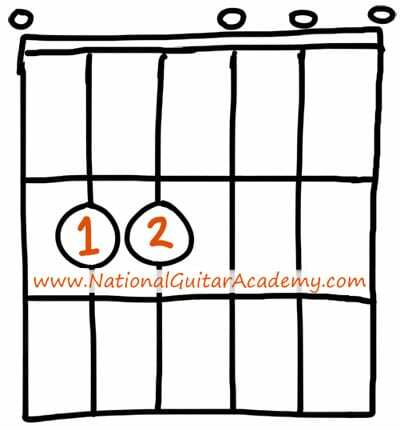 This classic folk rock song from 1972 is another two-chord job, which makes it one of the easiest guitar songs for beginners. If you’re a bit too young to remember the ‘70s and are wondering where you know this one from, it’s been featured in a few popular TV shows such as The Simpsons and Breaking Bad and the soundtrack of Grand Theft Auto. Top Tip: Some of the worst guitar songs for beginners are things like ‘Twinkle Twinkle Little Star’ and ‘Happy Birthday’. If your guitar teacher tries to teach you these songs, fire them immediately…! Don’t be put off by weird-looking chord names like D6/9. Like the Em7, it only takes one finger to play it… and you get to impress everyone you know by telling them that you can play a “D6/9”! So whereas we get an Em7 by pressing down the A string at the second fret, we get a D6/9 by pressing down the G string at the second fret. So basically, we can play this entire song using just one finger! The sequence is one bar of each chord in a repeating pattern. Unlike our previous two songs, this one has a shuffle feel. In layman’s terms, this means that our up-strums come a bit later than they would in a straight time feel. Watch this video for a clearer understanding of how to strum ‘A Horse With No Name’. As with ‘Born In The USA’, don’t be afraid to do your own thing with the strumming once you get into it. The aim is not to copy the record strum for strum, but rather to play in time with the right feel. As with all the songs on this list, take your time getting comfortable with both the chord shapes and the strumming. Like ‘A Horse With No Name’ you may recognise it from the soundtrack of a few popular TV shows such as The River and The Office. This song also has something of a folky shuffle feel to it and uses two chords. Dsus2 and G.
Now, we have a choice here as to what G we use. We could use the same G6 shape we’ve used in some of the previous examples, but I reckon it’s quicker to go for our high up sounding G as it uses just one finger and is a lot closer to the Dsus2. Also, because this song has a lot of up-strums, it’s best if the focus is on the higher strings (the thinnest ones). ‘Sons & Daughters’ has one bar of each chord in a repeating pattern. This is one of the harder guitar songs for beginners here. Notice how you need to add some deadening to create that syncopated feel? We get that by releasing our grip on the chords, just for a moment. We don’t remove our hand from the fretboard, we just relax the pressure on the strings. This kills the notes immediately and we can use this to create rhythm. Deadening is an intermediate technique (so you’ll find it hard), but give it a try, it’s great fun. While I do suggest playing these songs along with the record, at the same time, I’d also suggest getting comfortable with the chords and the strumming pattern first. If you’re struggling at all with the rhythm of this song, slow it right down for yourself to begin with. This is harder than the other songs here, so don’t sweat it if you find it tough at first! Remember, just because these songs are easy doesn’t mean they don’t take practise and patience. Take your time with them. Even the easiest guitar songs for beginners take concentration and focus to perfect. The next song we’re going to look at is “Stand By Me” by Ben E King. This is another of my favourite guitar songs for beginners. A genuine classic. It includes the four most-useful chords for a beginner guitarist to know. You can use a wide range of strumming patterns which helps you improve your rhythmic ability. The chords stay the same all the way through, so once you master the changes you can focus 100% on your strumming. We will play the easier versions of those 4 chords: G6, Em, Cmaj7 and Dsus. Strum each chord once, IN TIME, before attempting full strums. Get used to the chord changes. This helps embed good muscle memory.